This pecan pie was my third pecan pie to bake in a week. 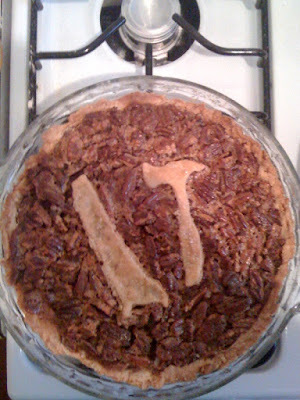 The first, I used Emily's mini pecan pie recipe but did not roast the pecans, the second I made Elvis's pecan pie, boy was it buttery, the third (pictured) I used Alice Water's crust and Homesick Texas blog filling,YUM! I think this was a perfect pecan pie! I topped it with a hammer and saw in reference to my favorite old time band. We carted the pie to Thanksgiving dinner at some new pals brownstone here in Brooklyn. The plate was licked clean. Here is a photograph of my impromptu apple pie. Sadly, I did not make the crust however, I glazed it with egg and sprinkled it with sugar. I used Emily's apple pie recipe and it was a hit. Served with some yummy blue bell homestyle vanilla ice cream. A perfect addition to a community puzzle jam new years eve party in blustery Dallas, Texas. That apple pie looks soooo good. I might lick my computer screen.